For a budget MP3 player, the A29 blends in a nice set of features without all the bells and whistles of the more expensive options on the market. 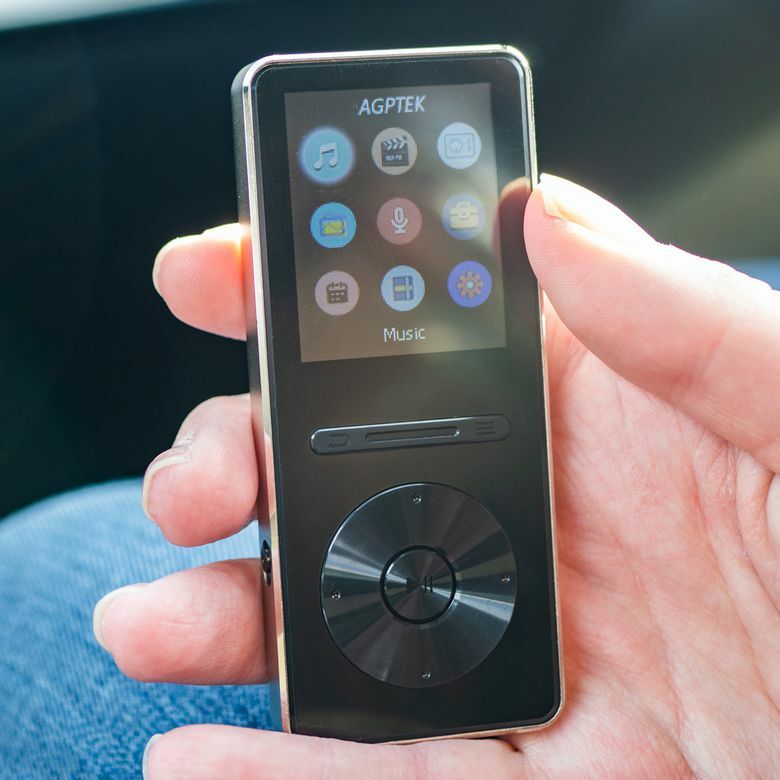 If you’re looking for an MP3 player, you might find a surprising amount of usability, even with an MP3 player as cheap as the AGPTEK A29. With easy-to-use (and surprisingly clicky buttons), a middle-of-the-road storage capacity, and impressive battery life, we were surprised at how much use we got out of the unit we were testing. There is a bit of a learning curve when it comes to formatting your music library, and navigating the dated menu setup can feel a bit like you’re operating a mid-2000s cell phone. But the build quality and the value you get, make this a respectable buy if you have a need for a dedicated music player. With a flat glass front and a ridged circular button setup dominating the bottom half of the device’s face, this MP3 player is clearly emulating the look of the original iPod Minis or Zune media players. That’s not really a bad thing, as it makes it clear where your fingers are supposed to go to navigate the device, and it looks mostly okay (though not as modern as the full touchscreen devices also available). Like many of the other AGPTEK players, the sides and backs are made of a coppery silver, brushed aluminum body that both feels premium and sturdy. It’s only 3.5 x 1.6 inches when looking at the front and only 0.4 inches thick, so it seems like it’s built the same as the rest of the AGPTEK chassis. This form factor feels both familiar and sleek, and we found it pretty pleasing when we were going for runs or running errands. Just like many of the other MP3 players from AGPTEK, there’s no clear indication about what the playback components are inside the device, nor are there any flashy upsampling algorithms or EQ polish. What you see is what you get with sound quality on this device, and what you see is an average spread of file type compatibility. For lossless options, you have standard WAV compatibility, so if that’s the format your high res collection takes, then you’re covered. But if you have AIF files, you’ll need to convert them to take advantage of this device. You can also play WMA, APE, AAC, the better-sounding FLAC and of course MP3 files. This constitutes a good amount of compatibility, but not quite the flexibility of more expensive units. Anecdotally, we found the playback to be pretty solid, extra full with WAV and FLAC files, and passable and punchy with MP3s. This is largely contingent on your headphones of course, but it passed our everyday tests. Like a few of the other options at this price point, you’ll get 8GB of storage and the ability to use a microSD card up to 128GB. This covers you for up to thousands of songs, and ends up being much less if you use larger files. This isn’t anything too unexpected, and will be serviceable if you’re looking to store a respectable collection of music on it. At 35 hours using plugged-in headphones, the battery life promise here is about 10 hours lower than many of the other options at this level. What’s good about this is we found that that hour count listed on the advertising materials was mostly honest. Our tests trended toward about 33 or 34 hours of music playback, so it’s nice to see you can rely on this player. It’s important to note that AGPTEK lists Bluetooth playback battery life at 9 hours and FM radio playback will run you about 10 hours of listening. All of this should cover you for an average day’s use, and because it will charge up via the USB 2.0 cable in just about an hour, this is an average, workable device where battery life is concerned. Arguably the best feature of this MP3 player is just how sturdy it feels. Because it’s so small, it actually means it’s more rigid and more prone to breaking than a larger, plastic MP3 player. Because the back and sides are made out of a rigid aluminum material, it feels very solid in the hand, and we found that, even though the back scuffed mildly from daily use, we were never concerned about tossing it into a bag with other items. Arguably the best feature of this MP3 player is just how sturdy it feels. The front is covered in a glass panel, so it’s possible the screen will be prone to some cracking and scratching, but because a large portion of this front panel is covered by a 2-inch circular button interface, it’s actually better on the durability front than a full touchscreen device. Something that’s also interesting about this unit is that there is only one toggle switch on the left side (that turns it off and on), and no other buttons. The USB and headphone jacks are on the bottom, and there’s a microSD slot without a flap covering it on the side. This gives it a solid, unibody feel that should last you through plenty of trips and workouts. The menu setup for this MP3 player feels reminiscent to old school flip phones, and that leads to some minor confusion as you’re navigating the menus. But because there are easy-to-find directional buttons on the front with a firm, clicky sound, it’s a lot easier to navigate than some of the more expensive AGPTEK units with capacitive touch controls. There are no flashy workout features here, but there is a voice recorder that you have to access via the virtual menu. It’s also really easy to transfer files to the device as your computer will read it as a simple mass storage device like a flash drive or an external hard drive. There’s a bit of a learning curve when naming your music files to be friendly for use on the device, and we found it easier to comb through our music using the folder system on the device itself, rather than the dedicated music menu. But, because the buttons are there and not flashy capacitive controls, we found a lot of the menu clunkiness easier to sift through and to ultimately forgive. At less than $30 from most retailers, the A29 offers one of the best options for those looking for a budget MP3 player. This is important because we envision this player being used mostly as a secondary music device for workouts or quick trips where you want to leave your phone at home. For this use, the price is a no-brainer, but because there are some limitations on file type compatibility, if you’re hoping for this to be powerhouse lossless music player, it won’t deliver. AGPTEK A01T: The A01 line from AGPTEK is largely the same as this unit, but with capacitive touch controls and some workout features. You’ll save a few bucks on the A29, and we actually found that the buttons made it easier to use. Sony Walkman NW-A35: This premium lossless player from Sony supports more file types and has a better UX, but costs 10 times the price. Plus, it actually doesn’t feel quite as durable as the A29. FiiO m3K: The FiiO m3K media player seems to offer better features on the DAC and playback front, plus more file compatibility, but in our eyes, it isn’t worth the more expensive price tag. Take a look at other product reviews and shop for the best budget MP3 players available online. ﻿For our money, the A29 offers the best value for most users, because for usually less than $35, you get a perfectly serviceable music player with an easy-to-use interface and a solid build. There are some limitations on the file compatibility front, and the menu is a little quirky, but with Bluetooth headphone connectivity and decent playback for WAV and MP3 files, it’s a great value for those who need a secondary device dedicated to playing music. Product Dimensions 3.5 x 1.6 x 0.4 in.